Marketing is a vital part of every business, but since customers are evolving, the strategies of reaching them must also change and be up to date. This is where marketing automation comes in handy. There is a long list of marketing automation platforms, and they are still increasing. You can even create a social media app by yourself to increase your sales. It is important to find the right marketing automation tool to maximize its benefits. However, finding the best tool for your marketing automation is not an easy task with so many of them in the market and each one promising you superb results. 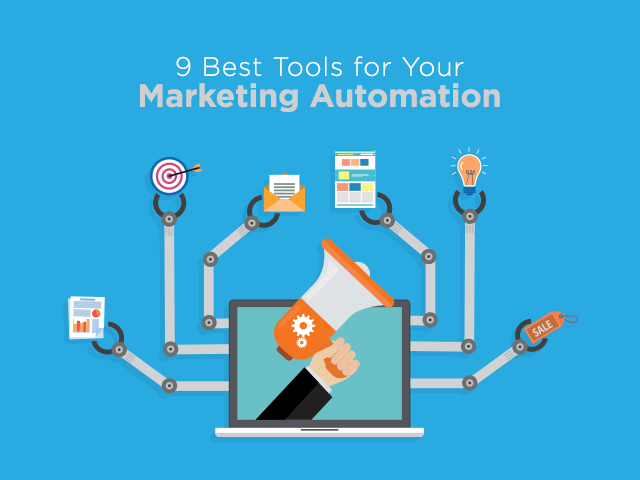 Below are the top 9 marketing automation tools. The HubSpot tool can be used for inbound marketing. It also helps you convert outbound leads into inbound leads. This tool can be used by any business, regardless of its size, and comes in three versions. The basic version costs $200 monthly and can be used for 100 contacts. Pro pricing will cost you $800 monthly with 1000 contacts, making it the most popular option. The most expensive version costs $2400 monthly and allows you to use 10,000 contacts. The HubSpot tool saves you time in identifying and nurturing leads. This is an all-in-one tool to help you manage your daily marketing related tasks. This tool is permission-based and fully integrated, with amazing customer engagement features. The marketing automation tool helps nurture both, identified and unidentified visitors, depending on their interest and browsing activities. This feature enables behavior and ad tracking which fill the sales and marketing pipeline. It is the best option for B2C marketers looking for lead qualification and an easy way to nurture leads through predictive lead scoring. Marketers enjoy benefits from multi-channel and omnichannel lead management campaigns, seamless integration, and personalized one-on-one communications with different data management platforms. The Buffer tool helps you maintain your brand presence online across social media followers so you can keep your followers up to date with your offerings. You can schedule posts, and they can go live on specific future dates while you are busy. You no longer have to worry about posting fresh content in social media accounts on a daily basis. Constant Contact has some useful and unique features to drive your marketing plans beyond the standard basics. It is an email marketing tool that will help you manage deals, coupons, events, and Facebook fan page promotions. The Constant Contact tool costs $20 monthly for 500 contacts if you are looking for email marketing only. To access other features, you have to pay for the $45 monthly version for 501 and 2500 contacts. For email marketing the same volume of contacts, the cost is $95. This marketing automation tool is excellent if you are looking for a way to boost your revenue. It comes with features such as lead nurturing, ROI reporting, lead scoring, CRM integration, and email marketing that enable you to up engagements with potential prospects. This automation tool helps your sales teams shorten their sales cycles. The standard version costs $1000 every month, and some of the great features include tracking prospects, nurturing leads, scoring and grading leads. When using Pardot, you also get ROI reports, integration of standard CRM, landing pages and forms. The Pro version is $2000 and comes with standard features, spam analysis, advanced email analytics, and email-rendering preview. The highest price is $3000 every month and has all-pro features plus API access, custom project integration, and custom user roles with 100, 000 cays every day. AdRoll is perfect if you want to retarget customers by engaging them through Twitter, Facebook, and the internet as a whole. It has flexible segmentation and both, cross-platform and cross-device retargeting capabilities. The key features are omnichannel and multi device utility, transparent analytics, conversion reporting, and expert optimization. The AdRoll has other amazing features such as the ability to customize ad budgets. If you are thinking about trying it out, you can get their two weeks trial without any commitment. This is one tool that every business owner should have if he or she wants to do online marketing effectively. It has excellent email features, automation, and CRM with good enterprise-level features, dedicated IPs and improved security measures. You can send as many emails as you want and enjoy using many user accounts without limitation. The social data gathering is automated in this case, and it allows you to get details of your email contacts and social media platforms such as LinkedIn and Twitter among others. The segmentation feature enables you to target the age group you want. It is a powerful software, but easy to use. You can use it to enhance marketing accountability and increase your revenues too. It is the best cloud-based platform you should use in marketing automation. Once you decide to use Marketo, you can start with a free version that has no installation costs. This tool was founded in 2006 and today has grown and reached many people all over the world. The company went on to buy the Crowd factory in 2012 to increase its social media capabilities. This successful company was listed in 2013 for the first time. The Marketo remains one of the most reliable marketing automation tools. Act-On is a cloud-based automation platform. It gives marketers a chance to combine lead nurturing, outbound and inbound programs. You can use it to maximize your sales. This company was established in 2008; however, it initially sold its products via Cisco only. It managed to raise $2 million. It is considered the best marketing automation tool for both medium and small businesses. The transformation it brings to your marketing strategy is what makes it one of the best marketing automation tools around. Choosing the best tools for marketing automation is not easy. However, with proper research, you can easily identify the right one for your marketing needs. Research online, read features of each tool, and settle for one that seems to meet your needs as a business owner. Prices can change, therefore, seek professional assistance for you to get the best tools that fit your needs. With all these said, which platform should you choose? Consider several things such as the size of your business and the type of services and products offered. The targeted market must also be considered before you get a marketing automation tool. Besides, the user interface of a platform matters a lot. Therefore, take your time and review several platforms to identify the best tools that you and your team can use easily. Remember, engaging in proper research, seeking professional assistance, and considering your budget and needs are essential. Being a content marketer at The App Solutions, Michael Shannon helps brands plan effective business strategies including creating, publishing, and distributing content for a targeted audience online. With 5 years of rich domain knowledge, he loves to share his views on modern technologies through his well-researched content pieces.